How do I format a CF Card on my Mac or PC? On Mac OS X formatting a CF card can easily be done inside the Disk Utility located in the Applications > Utilities folder. Insert the card in the card reader. 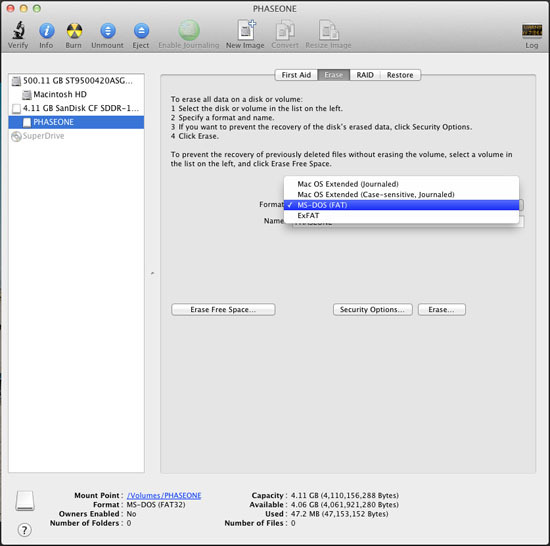 Open the Disk utility and select the Disk (not just the partition, but the entire disk). Select the Erase panel as shown below, and select MS-DOS (FAT). Choose Scheme>Master Boot Record on OS 10.11.x or higher. Give the disk a name and click on Erase to erase and format the entire disk for use with the P System. Formatting the Compact Flash Card in the Operating System may be necessary if the card cannot be read by the Digital Back System, or if it contains damaged data. Insert the CF-card in the card reader, and select the drive when it mounts in "My computer" or in the Explorer. 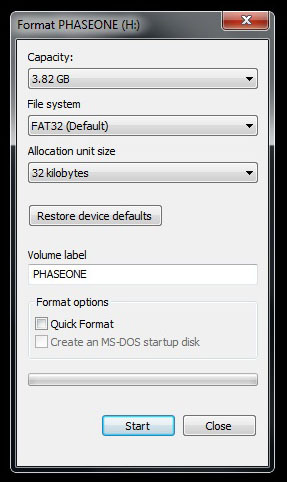 Select FAT32 or FAT16 from the "File System" pop-up.